related authors: Meletius, Gregory of Nazianzus. 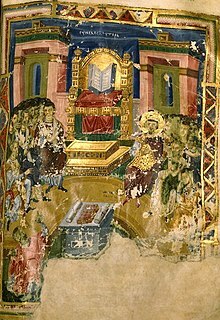 The First Council of Constantinople (Greek: Κωνσταντινούπολις Konstantinoúpolis) was a council of Christian bishops convened in Constantinople (present-day Istanbul in Turkey) in AD 381 by the Roman Emperor Theodosius I. This second ecumenical council, an effort to attain consensus in the church through an assembly representing all of Christendom, confirmed the Nicene Creed, expanding the doctrine thereof to produce the Niceno-Constantinopolitan Creed, and dealt with sundry other matters. It met from May to July 381 in the Church of Hagia Irene and was affirmed as ecumenical in 451 at the Council of Chalcedon. The Second Ecumenical Council, translated by Philip Schaff et al.